The parish of Our Lady of the Annunciation Coptic Catholic Church has grown with the neighborhood. The Rev. Youhanna Saad says its first Divine Liturgy, 18 years ago, had only four attendees; now, the church serves more than 600 families. Through his close relationship with the tight-knit community, Father Saad understands the concerns within his congregation. “There is a state of anxiety of the future and a feeling of fear because of the economic situation and increasingly sectarian incidents against the Copts,” Father Saad says. As it is the only Catholic church in a large area, buses bring families from a wide radius every Friday and Sunday to celebrate the Divine Liturgy. After the Friday liturgy, parishioners of all ages — but from one common economic background — come together to share an inexpensive breakfast of beans and falafel. The church acts not only as a place of worship, but also a site for activities such as nursery school, elder or youth meetings, Sunday school and programs to assist people with special needs. But the congregation continues to grow, outstripping the building’s capacity and prompting Father Saad to seek a license to turn a new building nearby — currently a service center — into a more ample church. ...Renowned as one of the most beautiful, cosmopolitan and diverse cities in the world in the first half of the 20th century, Cairo integrated people from different nationalities and religions into Egyptian society — where they could live, work and worship freely. This tolerant face of Cairo has gradually faded. Much of the country’s Jewish population left the country in the 50’s because of state persecution amid the Arab-Israeli conflict. Many of those who remained later faced expulsion — along with foreign-born Egyptian citizens who lost their citizenship — amid a wave of Arab nationalism intensified by events such as the Suez Crisis. And for a variety of reasons that often relate to economic mismanagement and a restrictive and heavy-handed state, many middle-class Egyptians, including Copts, have emigrated since the 60’s. Meanwhile, Egypt has witnessed the steady growth of the Muslim Brotherhood and other more militant Islamic groups such as Jemaah Islamiyah and Islamic Jihad. From a population of about two million in the 50’s, Cairo has expanded to some 23 million, growing in uncontrolled spurts. Among other factors, high rural unemployment has driven millions to Cairo in search of a better life. As a result, it has become one of the most polluted and congested cities in the world, ringed by unplanned districts where newcomers carry with them various, relatively isolated rural cultures, creating enclaves and slowing assimilation. Nowadays, Muslims and Christians in Cairo enjoy a mostly peaceful relationship. The megacity keeps its people busy with other daily crises. Moreover, the shared memory of a highly cosmopolitan city does live on in the old neighborhoods, old movies and other cultural relics. Read more. And take a moment to watch the video below, about one family’s struggles. Father Michael Perry, minister general of the Franciscans, walks past the rubble of a bombarded building in Aleppo, Syria, during an early April visit to Franciscan friars there. Fifteen Franciscan friars continue to live and work in Syria; two of the friars minister in towns controlled by Islamic State forces. The Rev. Michael Perry, minister general of the Franciscans, visited most of the friars the first week of April, but he could not enter areas controlled by Islamic State or by forces opposed to the government of President Bashar Assad. He drove to Homs on 7 April, just hours after U.S. bombers attacked the nearby Shayrat air base in retaliation for the Syrian government's suspected use of chemical weapons. “We didn’t see anything, but we certainly sensed the tension,” he told Catholic News Service in Rome on 12 April. In Damascus, he said, he and the other friars could hear bombing “every 20 minutes, 24 hours a day” from one of the neighborhoods controlled by opposition forces. “This was constant, a constant reminder that nothing is settled; everything is still up in the air and people feel a great deal of insecurity.” The people just want it to stop, he said. “The friars are staying with them and showing their solidarity and suffering the same conditions as the people,” Father Perry said. To be able to stay, they had to remove all crosses, pictures of saints and other visible signs that they are Christians. “It’s a miracle they’ve been able to negotiate the space, but it's a testimony to the perseverance and endurance of the Syrian people,” he said. Both friars are Syrians. Father Perry began his weeklong trip in Beirut with Franciscans helping those who have fled Syria. The rest of his trip took place by car, including long detours to avoid areas controlled by Islamic State or by opposition forces. At a Catholic parish in Aleppo, Father Perry brought a weighty contribution to the hope professed by parishioners, the women religious, the friars and Bishop Georges Abou Khazen, apostolic vicar for the city’s Latin-rite Catholics. “I’ve been in war zones for the (U.S.) bishops, I’ve been in war zones for Franciscans International, but I’ve never witnessed anything on the scale of Syria. Ever,” Father Perry said. In this image from 2016, Chaldean Catholic Patriarch Louis Sako of Baghdad is greeted by an elderly Iraqi woman after a prayer service at the Church of our Lady of Perpetual Help in Ainkawa. The patriarch this week released his Easter message to the Iraqi people. Alcoholism strongly afflicts Kerala, reputed to be the heaviest drinking of India’s 29 states. A 2007 report by the Alcohol and Drug Information Center (ADIC)-India, estimated Kerala’s consumption at more than two gallons of pure alcohol per person per year. Other studies suggest rising consumption rates since then — part of a broader trend spanning several decades. In the last ten years, Kerala’s government has made a number of attempts to combat alcoholism — including, in 2014, announcing phased prohibitionary measures, restricting alcohol sales in hotels and limiting liquor license renewals, resulting in the closure of hundreds of bars and liquor distributors. The effects have been inconclusive, and recent election results have likely signaled a shift away from such heavy-handed measures. Primary knock-on effects of alcoholism — domestic violence, marital crisis and the premature deaths of men — are clearly detrimental to children. But secondary consequences, such as the squandering of family income and the perpetuation of negative behaviors, also disrupt the lives of Keralite youth and obstruct them from reaching their full potential. With no easy answers in sight, it has fallen to the church and its institutions to seek solutions for a problem that seems only to be growing worse. And one way the church is trying to help is through education: creating institutions that help families struggling with a wide range of financial, medical or social issues. For more, check out the video below. Msgr. John E. Kozar, president of CNEWA, poses with a villager on 2 April in Batnaya, Iraq. Msgr. Kozar was on a pastoral visit to Iraq. Read more about his visit and his impressions of Iraq here. "The Next Two, Three Months Will Tell the Tale"
The altar is seen 3 April at the destroyed Immaculate Conception Church in Qaraqosh, Iraq. The next few months will determine whether Iraqi Christians can return to their homes in areas where Islamic State had been routed, according to Msgr. John E. Kozar, international president of Catholic Near East Welfare Association. Msgr. Kozar, who was in Iraq 31 March — 5 April, cited several daunting challenges for Iraqi Christians who return to their country: infrastructure woes, burned- and bombed-out buildings, desecrated churches and security issues. “Three liberated villages outside of Dahuk (in northern Iraq) are being resettled as we speak,” Msgr. Kozar told Catholic News Service in 7 April telephone interview from CNEWA headquarters in New York. “The reason people are very hesitant to go back there is the reason of security. They hold very close to them the reign of terror ISIS had produced. They’re looking for some reassurance from the Iraqi government and the Kurdish Peshmerga government,” the military force that has liberated areas previously under Islamic State control, Msgr. Kozar said. Msgr. Kozar recalled the extent of destruction at Immaculate Conception Church in Qaraqosh. The church courtyard, he said, was “all filled with soot, and there’s a heap of ashes in the center” as Islamic State had taken all of the church’s sacramentals, piled them up at the courtyard, and burned them. “ISIS had used it for target practice,” he added. “I even brought back shell casings as a little memento of the tragedy there. There was so much target practice there that they shot out two pillars in the courtyard. The clinic of Shajaiya in Gaza offers care to mothers and infants of all backgrounds. 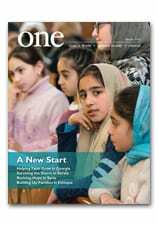 In the March 2017 edition of ONE, Hazem Balousha reports on a clinic operated by the Near East Council of Churches (N.E.C.C.) in Gaza. Here, he offers some additional impressions. As a journalist, you become familiar with many things as you work in the field and you meet and listen to people. I worked as a journalist for more than 17 years, mainly in the Gaza Strip and West Bank. I met thousands of people, I heard various stories, and I read millions of words from papers, books, and online. Yet I was surprised when I visited the N.E.C.C. clinic of Shajaiya, east of Gaza strip — first, from the services they provide, and then from the stories of people who are going there to receive the health care. I thought Gazans are less interested of having big families. But when it came to Shajaiya, it was a different. Most of women that I met and interviewed there want to have big families, with at least six children, despite the poverty and limited income. I was curious about why a young couple with limited means would want to have a big family. She told me that she advised her two married daughters not to have too many children — just five or six. One of her daughters got married almost four years ago and she is expecting her third baby. I am still surprised, as both daughters live in poverty. I was worried when I read the recent U.N. report that Gaza Strip population will exceed three million within 14 years. This small place that is facing a critical shortage of basic needs will have that number of people sharing the services and infrastructure. Read more about the clinic Where Hope is Kindled in the March 2017 edition of ONE. And to get an intimate glimpse of the clinic, check out the video below.